Warning: this may put you off chocolates for a while. It definitely left a sour taste in the mouths of Rachael Vile and her roommate. 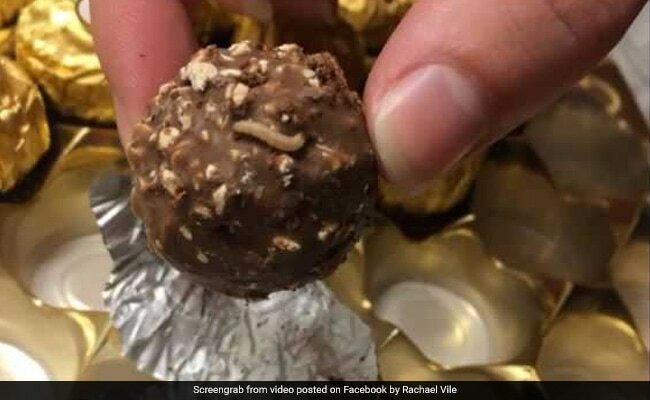 The woman from Illinois, US had bought a box of Ferrero Rocher chocolates and says she was horrified to find maggots crawling out of the chocolates. This after the two women had eaten nearly half the chocolates in the box. A Facebook post with videos and photos of the maggots has gone viral with over seven lakh shares. One the the videos showed Ms Vile peeling the gold foil off one of the chocolate pieces and pointing to the wriggly creatures. She found more maggots upon opening another piece of chocolate. "Never eating these again!!!! This is what my roommate and I found. Maggots in every single one," she wrote in the post. The video, with over 49 million views on Facebook, made people squirm with disgust. "I can never eat these again," wrote a user. "Wherever they were stored there must have been flies around I'm never eating them again either yuck," wrote another. But many pointed out that the maggots may have something to do with how the chocolates were stored. Ms Vile stated in the post that the 'best before' date on the box was March 6, 2018. She told NDTV that she has written to the company and is waiting for a response from the chocolate manufacturer. A company spokesperson told Daily Mail that their products need to be "stored carefully" and they advise specific storage conditions that are mentioned on the product packaging. "We would like to reassure everyone that at Ferrero, we pride ourselves on the quality of our products and have strict quality control procedures in place throughout our operation," they told the website. "We take every consumer issue seriously and are already in contact with the consumer to investigate this matter fully."